The 2012 Sporadic E-Skip season officially ended on July 31 in Northern Virginia, and with it came a disappointment. This year’s season continued a downward spiral in all aspects of DXing which has been locally experienced since 2009. Every year since then, the amount of new logs, openings, duration and general quality of Es openings have gotten worse. There was no Es during 35 days of the season—between June 16 and July 24. The surprising lull in a typically-busy part of the season was equally shocking since it ended with an almost all-day marathon opening on July 24 which brought in 20 new logs with regional reports of a MUF close to the reported 200 MHz MUF in the historic July 6, 2004 opening. I divided this review into separate categories, each individually graded on an eleven-point scale. A grade of ‘C’ is average. A category performing better than the previous year will automatically get at least a ‘C’ grade, while a category performing worse will get a C- or lower. The final verdict for Es season 2012 will be an average of these grades. This review considers the Es season to be between May 1 and July 31. This review will be updated if an Es opening occurs after July 31, but it will not factor in the grading. 6/18/13 update: I came across previously lost records from 2007-2009 regarding opening totals. A few charts have been edited to reflect the true totals. The grades in each category did NOT change as I feel it is not fair to re-grade seasons after-the-fact, and because the changes have been minimal. The charts above show the ‘spread’ of every Es season since 2007 on a timeline representing May 1 to July 31. Each dot represents one Es opening where its date corresponds between May 1 and July 31. Portions without dots represents a lack of Es openings. Years with more openings, such as 2007, show more dots, while the aforementioned 35-day lull in 2012 is seen in the latter half of June and most of July. One aspect I found interesting this year was that Es seemed to happen only between 9 a.m. and 5 p.m.—normal business hours. I am home from work at about 6:45 p.m., a time which usually yields great late afternoon and evening Es all season. But this year, I only worked 2 openings during this usually-fertile time period. I talk more about this strange phenomenon in this June 16 post on this website. In past years, openings followed the stereotypical Es mold of 9:30 a.m. to 11:30 a.m., then again 5:30 p.m. to 9:30 p.m., give or take a few hours based on the opening. But almost all 2012 Es openings were gone before 6 p.m.
An even more concerning phenomenon during the 2012 Es season I saw was that almost no DXer in the U.S. got substantial Es between about June 10 until July 15, save for a few occasional, weak openings in-between. I’ve long got the short end of the stick when it came to Es openings—regional DXers in MA, CT, PA, DE and other places 150-450 miles away, in previous years, would get Es to the top of the FM band for hours on end, while I’d get nothing, or short fade-ups <92.1 MHz. This year, even these well-positioned DXers frequently got nothing. I actually had a few openings where I had full-band Es without the aforementioned DXers getting anything—a stark reverse from the norm. I haven’t seen this since 2006 when I started monitoring Es daily. Only one opening broke past the midnight threshold—June 10 into 11. Although a remarkable feat for any opening, it got overshadowed by the plethora of shortcomings for this season to be interesting. A common phenomenon that hits hard in DXing is Murphy’s Law. Without fail, if I leave my radio and have to go somewhere (work, errands, etc.) the band will, without doubt, open up to 107.9 MHz and stay there for hours. The opening in this situation would, of course, fall out of FM before I have a chance to DX the band. Any unattended recordings, in this situation, would only yield relogs and other Es pests. This proved true for Es this year. I missed portions of most openings—the best and strongest parts, as exoected. But I went on vacation during the week of June 25 and brought my Sony XDR radio with me. Although I enjoyed up to 540-mile tropo on vacation, I didn’t see one peep of Es on-location or at home upon review of my unattended recordings. This alone is proof that the “away from radio = 107.9 Es” Murphy’s Law condition didn’t apply this year. Since my vacation, me being away from my radios had no bearing on a Murphy-induced 107.9 Es opening. Es simply was not happening anywhere. If it wasn’t for a 110-degree heat wave in the area, I would’ve assumed it was December. Most shockingly, the utter lack of Es in 2012 seemed to be limited to the U.S. European DXers got to experience several hours-long high-MUF openings on many days like the U.S. did in years past. It makes me wonder what was different environmentally/celestially/etc. this year that caused stateside DXers to get the shaft, since it is apparent Es was in full swing like average in other parts of the world. Openings are counted once per day above, even if openings happen at different times in the same day. I decided to do this because I have no way of knowing if what appears to be two openings were, in fact, the same opening which (for a period of time) had a MUF below 88.1 MHz. This also takes into account unattended openings which could’ve popped up undetected. 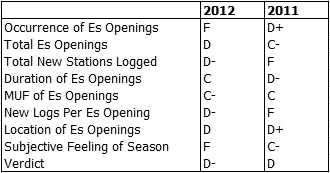 The 2012 Es season was brutal with the lack of openings. As you can see, in 2007 I had 19openings. 2009 came in with a respectable 16 openings. Nine openings in 2012 is ridiculous, given only two of them were substantial enough to override local stations, trip HD reception, etc. This was taken for granted in almost every opening in years prior to 2009. I would’ve given this category a ‘C’ if the amount of openings stayed identical to 2011’s. 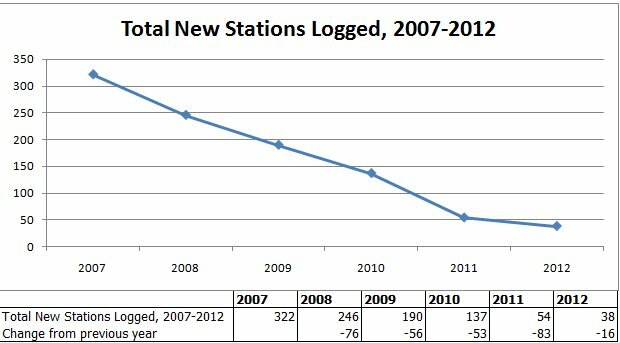 Mirroring other graphics on this page, the amount of stations logged since 2007 has progressively gotten worse. Part of this is expected, as there is a fixed (more or less) amount of FM signals available to log in my Es range. Every signal I log brings me that much closer to the grand total of possible DX targets. But that doesn’t mean an entire Es season should yield 38 total logs, especially since I logged as many as 137 new stations as recent as 2010. One week of Es in 2009 would have probably matched the entire 2012 season’s new logs threefold. Es in general seemed to take a nosedive in 2009, as previously mentioned. But the only reason this category gets a D- and not an F is because the general freefall of new logs almost evened out when comparing seasons 2011 to 2012. The nosedive wasn’t as dramatic between 2011 and 2012 as it was 2010 to 2011. One more good opening could’ve even, for the first time since 2007, netted one more logging than the year before. Don’t let the grade fool you—I am comparing this to the 2011 Es season as I do in every year’s review. Almost every opening (save for June 12 and July 24) were weak with deep fades. Often, Es signals sounded like weak tropo and never tripped RDS or HD-quality strength. Also, most of the times listed above were based on unattended recordings, so even though I didn’t physically DX over 744 minutes of Es, the fact remains the band was open at least that long locally this year. 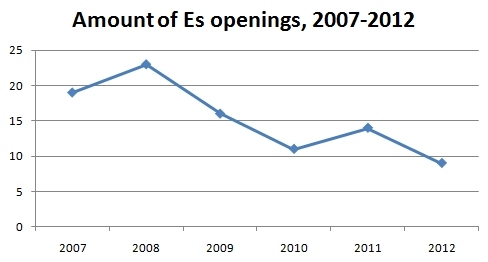 In comparison, 2011 saw at least 872 total minutes of Es with six more openings—an average of 40 or so minutes per opening. Es 2012 was short but the (much fewer) openings tended to stick a little longer. Times from multiple openings spanning different times of the day are combined for a grand total in this category. Only one opening in the entire year reached the top-of-the-band frequency of 107.9 FM. But it fell not too short from the top at another time, at 107.1 FM. This category was difficult to grade since I missed parts of most openings where the MUF could have been up to 107.9 FM. Therefore, I’m going to give the season the benefit of the doubt and grade it a C-. The fact remains that mid and high-band MUFs were seen this year, even if the season itself was lacking in compared to previous years. This category goes without saying—2012 was brutal in regard to new loggings. 33 percent of openings in 2012 resulted in no new logs. 2011, which saw 14 total openings, had 28 percent of logs with no new stations recorded. Only one opening received over 8 new logs—pitiful by any stretch of the imagination. If it wasn’t for the saving-grace opening of July 24, this category would have received an F.
Es 2012 had little to no variety in regard to locations of signals received. Florida, a *major* target area for FM signals, was received only once the entire season. This is unfathomable for me, since it was, in previous years, to the point where Florida FM signals are ‘pest’ stations in the summer months due to the normally very common openings there. The Midwest was the most common paths this year. TX and LA, which typically have a stronghold on openings location-wise, were seen only three times this year, also. Only one signal from the Canadian Maritimes was received all year. In comparison, the only area not received in 2011 was the upper Midwest. This category ignores statistics and focuses on my gut feeling and observances of the season. It also looks at factors that the above categories don’t consider. I had high hopes for the 2012 Es season. I initially ignored the apparent downward trend of Es in almost all categories since 2009, hoping 2012 would be the year it would turn around. I was wrong. I can’t even say Es 2012 is ‘more of the same’ when compared to previous years. Es season 2010 started on time (May 24) and the last opening was seen on July 3. In effect, the last ‘half’ of Es 2010 was not observed. In 2011, Es didn’t really pick up until June 25, meaning the first month of the year was not observed. All in all, combining Es seasons 2010 and 2011 equaled one typical season in terms of openings, logs, etc. Es season 2012 started on time and ended on time, but over a month was missing in the middle. Out of a possible 91 days of Es between May 1 and July 31, only 10 calendar days total were observed with E-skip. That is depressing, ridiculous and unbelievable. In fact, I wrote this entire review on July 11, usually in a time where the entire band would be full of marathon Es openings. I didn’t even wait until the end of the season to do it, since I already knew what the grade was. I changed little after the opening of July 24, but the bulk of the review remains unchanged. It would’ve been foolish to write an end-of-season review so early even in 2011. Es season 2011 still was worse than 2010 but had a “quality vs. quantity” aspect where I could pick out *some* good points. I can’t think of one good thing about the 2012 Es season other than receiving the first Es signals ever over local 104.1 and 107.3 FM—two strong signals—on July 24. Even then, I was in my car parked in an area known to attenuate locals, so I was helping the Es get through the signals. It says a lot about a season when only one opening is the go-to event for anything of merit. 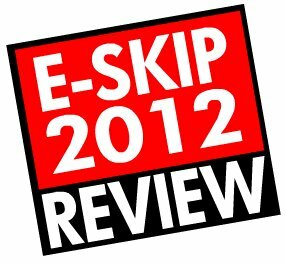 Given that the downturn in E-skip has continued yet another year, I honestly can predict little to no E-skip locally in 2013. I’d be happy with one opening with one relog received for 10 seconds, at the rate things are in the charts above. It almost makes me want to reconsider the time I focus on the hobby when there is such a huge lack of Es, given I don’t have any tropo outside of relogs year-round. It is getting to the point where there’s no reason to even turn on my radio, even when regional DXers report marathon 107.9 openings as I usually get zip locally. I say this with hopes I’ll be proven wrong and Es will be great in the future, but I’m not holding my breath.